My husband is from Sanpete County, Utah. Sanpete County is know for its turkey farms. In the city of Manti, they host a large BBQ turkey dinner every summer. Since it isn't always easy to find turkey steaks where we live, I started using the Manti turkey marinade on pork chops. I have used both bone-in pork chops and boneless pork chops and both have turned out moist, flavorful, and delicious. In the words of my mom, "These are the best pork chops I've ever had!" I hope you enjoy them too. Using a fork, pierce holes in the pork chops and set aside. In a large bowl, tupperware container, or gallon size ziplock bag, mix the lemon-lime soda, soy sauce, cooking oil and garlic salt. 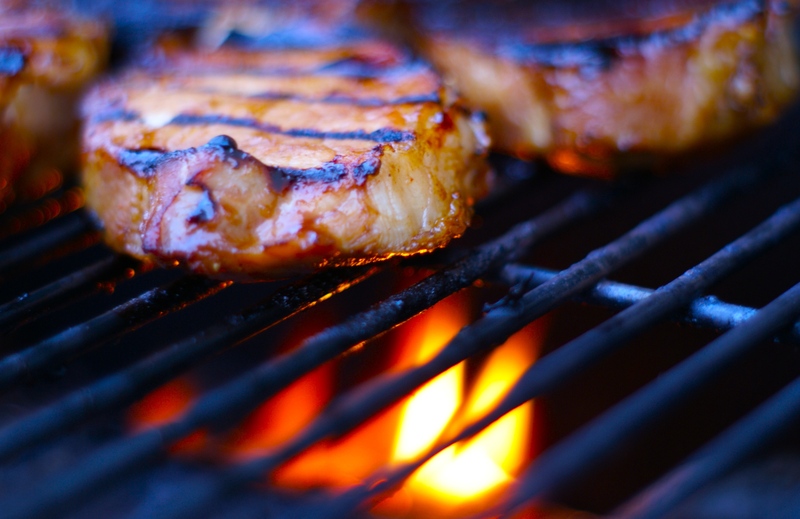 Place the pork chops in the marinade and allow them to marinade in the refrigerator for at least 2 hours. (Marinating them overnight is best). Set George Foreman grill to 340 degrees. Cook for 8-9 minutes.